The -Ber months started and to start the treats or gifts giving, STARBUCKS put a one foot forward for all of us to enjoy. Starting September 15, two new beverages as well as delectable food items together with new breakfast sandwiches will be available in all Starbucks branches nationwide. 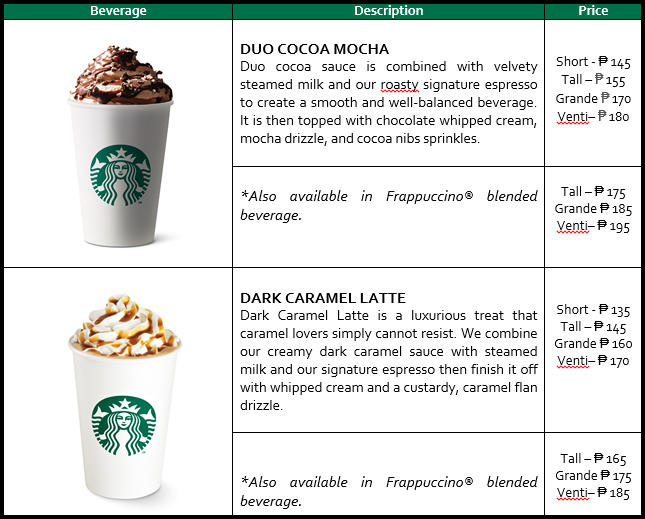 Starbucks two new beverages includes the Dark Caramel Latte and the Duo Cocoa Mocha. 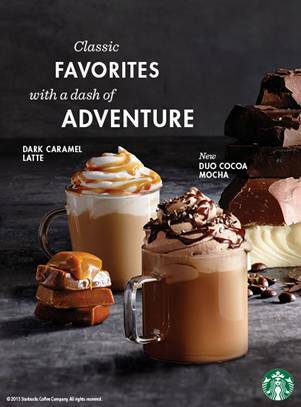 These all new classic favorites with a dash adventure, will give you an enjoyable experiences of having a Frappuccino blended beverage with your family, friends, co-worker or even clients. For individuals who love dark coffee (like me) and to taste that roasty signature espresso, we should had try first the Duo Cocoa Mocha. On the other hand, for the individual who have a sweet tooth and loves to indulge with overloading sweetest (figuratively and literally), enjoy the Dark Caramel Latte. Select registered My Starbucks Rewards® customers will receive a promotional e-mail with an offer to purchase a Duo Cocoa Mocha and/or Dark Caramel Latte before its public launch, from September 12-14, 2015. Offer is limited to the featured beverages (hot, iced and blended variants). Customer must print a copy of the e-mail or show it through any mobile device at any Starbucks store in the Philippines to avail of the offer. Featured beverages must be purchased with a Starbucks Card. Each customer may purchase up to two (2) featured beverages per transaction only. o Complimentary Starbucks Reserve® coaster and 3oz. Starbucks Reserve® mug will automatically be given upon purchase. o This promotion cannot be combined with other offers or discounts. o Offer cannot be exchanged for cash or credit. Per DTI-FTEB SPD Permit No. # 11383, Series of 2015. STARBUCKS VIA® LATTE WEDNESDAYSTERMS AND CONDITIONS:o Customers who will purchase a Duo Cocoa Mocha or Dark Caramel Latte on September 16, 23 and 30 will receive a complimentary stick of Starbucks VIA® Latte (Caramel or Mocha). o Offer is limited to Duo Cocoa Mocha and Dark Caramel Latte only (hot, iced and blended formats). o Offer cannot be combined with other offers or discounts. o There is no limit to the number of times a customer can participate in this promo. o Offer is valid in all Starbucks stores in the Philippines. For you to complete the moment, Starbucks will be offering featured food items and new breakfast sandwiches simultaneously. 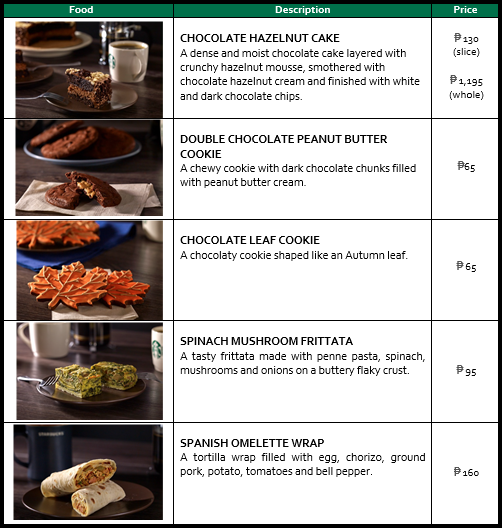 These food items will be a perfect combinations with the variety of beverages offered exclusively at Starbucks, specially the new beverages. See the photo below, a material emailed to me to share to all of you :). 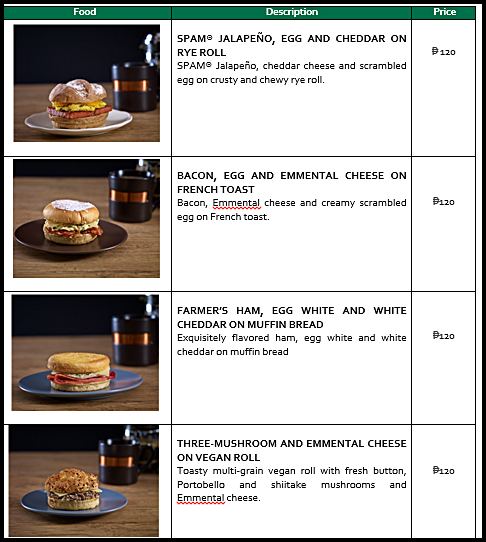 The first photo is the Starbucks Featured Food Items which you can enjoy more anytime of the day and the second photo below will the newest breakfast sandwiches offered only by Starbucks. And finally, Starbucks also offering the newest and limited edition card design that you can use to maximize the perks and privileges when visiting Starbucks. A classic and sleek design, with a majority of black color that will represent the premium quality of Starbucks beverages. That a great treat right? Well remember that all these are all available starting September 15 okay. See you at Starbucks ;).